And we are having this panel discussion to release a report on immigrant welfare we’re releasing today, but which is a companion report to one we released last week. They’re, in a sense, sort of two parts of the whole. Last week’s looked at the overall combined immigrant use of government – taxpayer-funded, means-tested government services. The one we’re releasing today is the same data, but separating out the legal versus the illegal immigrant headed households. And so the – we’re going to start by having Steven Camarota, director of research at the Center, discuss his findings, talk about what they discovered. And then we’re going to have two respondents. First, Robert Rector will be speaking. He is from the Heritage Foundation, is one of the country’s leading authorities on the issues of welfare, and is, in fact – was dubbed the godfather of welfare reform, which I don’t think I’d seen that before, but I like the title. (Laughter.) I haven’t kissed his ring yet, but I’m not sure if that’s now required. 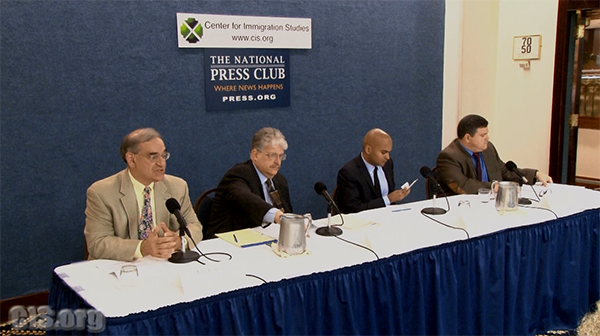 And both in the last round, in the 2006-2007 round of immigration policymaking/lawmaking in Congress, and then more recently in 2013, authored or co-authored major studied from Heritage highlighting the net costs of immigration, of the proposed changes, looking at the services use and taxpayer and what have you. So he’s one of the – probably one of the best people in the country to be commenting on these findings. And then our second respondent is Reihan Salam, who is executive editor at National Review, columnist also at Slate, and co-author of – I keep – with Ross Douthat of “Grand New Party,” which is sort of the manifesto for I think what they called Sam’s Club Republicans, right, or Costco Republicans, something – one of the – BJ’s Republicans? It was one of those – (laughter) – one of those places. And he’s written a lot on the issue of immigration and less-skilled workers, and especially the children of immigrants and their successful or unsuccessful incorporation into the society. And so after our three speakers we’ll have some discussion, Q&A. And so, Steve, will you kick it off? STEVEN CAMAROTA: Sure, Mark. Thank you. Now is this working? OK.
Well, I’ll try to keep my comments brief. Although I love to drone on, I will try not to do that. I will touch on both studies – both the one we’re releasing today and the one from last week, because the one today builds on the one from last week. The first study, as we say, was released last week, and it dealt with all immigrant households, legal and illegal, that are in the Census Bureau’s data. In the report released today, we divide legal and illegal immigrants and look at their welfare use separately. Immigrants – or the foreign-born, in Census Bureau parlance – are individuals who are not U.S. citizens at birth. It includes naturalized citizens. It includes green card holders, illegal immigrants, and a relatively modest number of long-term visitors such as guest workers and foreign students who show up in Census Bureau data. Now, as I say, let me – let me focus first on all immigrants, and then I’ll move on to the legal/illegal distinction. To study immigrant welfare, we used the Census Bureau’s Survey of Income and Program Participation. It’s also referred to as the SIPP – S-I-P-P. While its complexity makes it difficult to use, there is widespread agreement that it is by far the best data that the government collects on welfare use for households, families, individuals, what have you. So what does it show? Well, the SHIP – SIPP – I’m going to say that right – the SIPP shows that households headed by immigrants use welfare at significantly higher rates than natives, even higher than indicated by other Census surveys. That’s one of our big findings. There’s another Census survey that has traditionally been used to study immigrant welfare. It’s called the CPS, or Current Population Survey. In March of each year they oversample minorities and ask a lot of questions about income and use of welfare programs. And that survey showed that immigrants did have higher welfare use rates, but the gap between immigrants and natives wasn’t as high. In the SIPP – the more accurate of the surveys, the one we use – you get an even bigger gap between immigrants and natives, but both groups have higher welfare use in the SIPP than in that other survey, the CPS. Now, overall we found that in 2012, of all immigrants – legal and illegal – 51 percent of households accessed one or more of the major welfare programs – typically two or three at a time of course, because these programs are all linked. The comparison figure to the 51 percent is 30 percent for the native-born. “Welfare” in this study, in case you’re wondering, includes Medicaid; the cash programs, mainly TANF and SSI; the food programs, WIC, food stamps and free lunch; and the housing programs, both public housing and subsidized housing. Now, we also found, interestingly, that welfare use is high for both newly arrived immigrants and the well-established. For example, of immigrant households headed by someone who’d been here for more than 20 years, 48 percent accessed one of the major welfare programs. No single program explains the higher overall rate of immigrants. Even if you start excluding programs, which we do in the study, you still find that the immigrants have the higher rate. In a little more detail, immigrants have significantly higher use of food stamps, 40 versus 22 percent, than natives. If we compare to Medicaid, 42 percent of immigrant households receive some sort of Medicaid, 23 percent of native households. Immigrant use of cash is somewhat higher, 12 versus 10 percent. And use of housing programs is about the same. Now, welfare use also, we found, varies among immigrant groups. For example, immigrants from Central America and Mexico – and that’s how the data is grouped; we can’t divide that – about 73 percent of those households accessed one or more welfare programs. That’s the highest of any of the groups we could look at by country. And for those from South Asia have the lowest rate – that would be like India, Pakistan, Bangladesh. That would be about 17 percent accessed welfare. So big differences between immigrant groups. And part of the reason – we’ll come back to this, I think, throughout the whole discussion – is education levels. The least-educated immigrants tend to come from Central America and Mexico, and the most-educated come from South Asia. And the welfare use rates reflect that because people with less education tend to earn less and be more likely to be eligible for programs. People with less education also have higher fertility, so they’re more likely to have kids. And that also helps them access programs or qualify for them. Which gets to a main point. I guess one of the key findings is, look, many immigrants struggle to support their children, and a large share of welfare use is received in behalf of U.S.-born children. It should be – it would be fair to say that what happens is that many immigrants come to America, have a child or more than one child, but are unable to support those children, and so a large share of immigrants turn to the taxpayer to feed and house and provide health care for their kids. However, one interesting finding is that even – again, looking at all immigrants, legal and illegal – even when we look at households without any children in them, the immigrant rate was still statistically higher – 30 percent for the immigrants and 20 percent for the native-born. So the results often reflect the presence of children, but when we exclude children this very significant difference between immigrants and native households continues. Now, it must be remembered that welfare – the welfare system is designed to help low-income workers, especially those with children, and this describes many immigrants. So when we looked at households with only a worker in them – at least one worker, sometimes multiple workers – it doesn’t make much difference to the welfare use rates: 51 percent of immigrant households used welfare, even though there was a worker present during 2012, compared to 28 percent of native-born workers. It didn’t make much difference to either of the numbers. And that’s because the vast majority of households using welfare have a worker. If you had to put, though, the findings in kind of a bumper sticker with regard to the high rates of immigrant workers accessing these programs, there’s a high cost to cheap labor might be a way to put it. Now, this is one of the central findings – which may not surprise welfare researchers, but it may surprise members of the public – welfare and work go together. Let me just give you a quick example. A family of two children and a – and a parent, mother or father, working, making $20,000 a year, qualify for just about every non-cash welfare program there is in just about every state. And that would include things like food stamps and WIC and free school lunch and Medicaid, public housing and so forth. If their monthly income is low enough for parts of the year, then the family would also be able to receive cash programs as well, at least for the times when their income is low. The large share of immigrants with low levels of education and resulting low incomes partly – and mostly, actually – explains their high welfare use. Immigrant households, for example, are more than three times as likely as native households to be headed by someone who has not graduated high school. The welfare use rates for less-educated immigrants are incredibly high. So if you looked at a household headed by an immigrant who doesn’t have a high-school education, which is about one-fourth of all immigrants, 76 percent of those households access welfare, just to give you an example. Now, although these numbers may seem shockingly high, no one has disputed the accuracy of our report. The main response, mostly by open-borders libertarians, has been that immigrants may use more welfare than natives, but poor immigrants or less-educated immigrants use slightly less than poor natives – so, I guess, not to worry. Now – (chuckles) – this is true for some programs, but as we show in the report, it’s not true for others. But it’s kind of besides the point: immigrants’ poverty rate is about 50 percent higher than the poverty rate for natives. The welfare use rates simply reflect this reality. The fundamental question is, does it make sense for our country to have an immigration system that produces an immigrant flow in which a large and significant share are less-educated than the native population, and is therefore significantly poorer on average and makes heavy use of welfare? Now, it’s worth mentioning that – and I won’t go into great detail – that you can kind of try to see the impact of refugees and asylees on this data. They have more quick access to welfare than anyone else. They’re allowed into the country for humanitarian reasons. But they don’t seem to make that much difference. There’s some other data we can look at; that’s not what’s driving the numbers. They make up only about 13 percent of legal immigrants, and a smaller fraction of all immigrants because all immigrants include illegal immigrants, so they’re not driving these numbers. Their welfare use rates, as far as we can tell, are not particularly high relative to other immigrant groups. Another interesting aside, I think, is that in addition to the cost to taxpayers, these figures probably do have political implications that are worth thinking about. The high welfare use of immigrants may help to explain, for example, why survey data shows strong majorities of voters in immigrant communities tend to be supportive of government programs and big government. And I think maybe the use of welfare, you know, reflects that. And so that’s why the policy preferences, if you will, of immigrants generally tend to be supportive of government that’s, you know, big government, if you will. Now, turning to welfare use by legal status, that report that we’re releasing today again used the SIPP, the same data, now. But the SIPP has two questions in it that are very interesting that I could explain in the question-and-answer period if you’d like, but they make it a lot easier to identify illegal immigrants in the SIPP. They ask about, did you come legally, are you – did you change your status. And it looks like most people who are illegal – here illegally do answer those questions honestly. And that’s – that doesn’t mean we can get all the illegals that way. What we do is we then use other questions in the survey to get the full picture for illegal immigrants. But the SIPP is much easier to use in that respect. What we find when we look at legal versus illegal immigrants is that both households use a lot of welfare. Our best estimate is that 49 percent of households headed by legal immigrants used one or more welfare programs in 2012. Again, the comparison is 30 percent for native households. Households headed by legal immigrants have higher welfare rates than natives overall. And for cash programs, 14 percent versus 10 percent; food programs, 36 versus 22 (percent); and Medicaid, 39 versus 23 (percent). Use of housing programs is similar. Further, legal immigrant households, it must be remembered, account for three-fourths of all immigrant households, and they account for about three-fourths of all immigrant households using welfare. So they use welfare about in proportion to their share of the immigrants – of the overall immigrants. We also estimate – I mean, this may be surprisingly high, but it really isn’t when you consider the overall rates – we also estimate that, of legal immigrant households with children, 72 percent accessed one or more welfare programs. The rate for natives is also high, it must be pointed out, at 52 percent. But again, maybe the way to describe it is at a time when lots of Americans seem to be struggling to provide for their own children, we have a legal immigrant flow that’s adding folks who struggle even more to support their own children. As is the case with immigrants overall, one of the reasons legal immigrants have significantly higher welfare use is the – is the large share with modest levels of education. But here’s something that is surprising that is not that easy to explain, and it’s an area in need of further research: We also found that even among households headed by people with a Bachelor’s degree, those headed by a legal immigrant used welfare at double the rates of households headed by natives headed by person with a Bachelor’s degree. Now, there’s several reasons, probably, for this, but it is puzzling. You would expect that the welfare use rates of the most-educated would be very low, but they’re not. They’re pretty low among the native-born at 13 percent, if you consider that low. But at 26 percent, one out of four of these households headed by someone with a Bachelor’s or a graduate degree in the immigrant community access welfare. This suggests that there are other causes to high welfare use among immigrants, like culture. It also indicates, certainly, that the social networks that immigrants rely on to get jobs, find an apartment, are also very effective at helping them navigate the welfare system. Looking at households headed by immigrants in the country illegally, we estimate that 62 percent used one or more welfare programs in 2012. Households headed by illegal immigrants tend to have much higher rates of food use – 57 versus 22 (percent) for natives – so they’re using a lot of food stamps, a lot of housing, a lot of free school lunch and a lot of WIC. A very large fraction of illegal immigrants have their children signed up for Medicaid – 51 percent do, versus 23 percent of households headed by the native-born. However, use of cash programs by illegal immigrants is lower, at about 5 percent compared to that 10 percent for natives. And there’s not much difference in the use of housing programs. Now, it’s very important to understand that there is a child present in 86 percent of illegal immigrant households using welfare, and this is the primary way that these households access programs. If we just focus on illegal immigrant households with children, 87 percent of those households access one or more welfare programs. So what does all this mean, whether we’re looking at immigrants overall, legal or illegal? All this means that when someone like President Bush says all that matters is matching a willing worker with a willing employer, these data suggest that is a grossly inadequate way of thinking about immigration. There are enormous implications, particularly for bringing in unskilled workers, for the American taxpayers. Now, of course, less-educated natives also use a lot of welfare. But they’re already here, and of course they’re already part of our national community, so there’s no added cost. Immigration is different. You’d be bringing in new people who would then turn to the taxpayer. Now, very briefly, many of you may wonder, how is it that immigrants can use so much welfare, given that the ’96 welfare reform law in particularly tried to curtail immigrant welfare use? And on top of that there’s a longstanding idea called the public charge, which is if you become dependent on the welfare system, technically you can be deported. Well, let me just say this about public charge. Let me say this. We have an appendix starting on page 25 of the larger report, the first report, explaining why the restrictions on immigrant welfare don’t work as intended and likely never will. But just give you two quick examples. There’s a thing called the public charge, which says, again, that if you become dependent on welfare, that you could – probably you could be deported for that. But it turns out that in all of 2012, despite the numbers I’ve just gone over with you, only one person – one immigrant was ever investigated for public charge, and that person’s – and that case was dropped. (Laughter.) So I think it would be fair to say that that’s not a very important provision. Let me give you another example. Part of the ’96 welfare law was that you had to go to your sponsor for support if you got in trouble in the first – after you – in the first 10 years, basically, and you weren’t supposed to go to – you weren’t supposed to go to the taxpayer, as it were. But there’s a thing called the immigrant exception. MR. CAMAROTA: Indigent, I’m sorry. The indigent exception. And if you are an indigent immigrant – that is, you’re poor – then you don’t need to go to your sponsor. You just apply for it and you get it for 12 years, and you can get that renewed. So the whole idea of going to a sponsor is entirely negated by that policy. You know, in short, let me summarize by saying that restrictions from the ’96 law actually only apply to some programs. They don’t apply to most immigrants because most immigrants have been here longer. Most immigrants are legal and have been here longer. There are all these exceptions, as I said. States often provide welfare with their own money. And some provisions are entirely enforced – unenforced. It’s also the case that immigrants can receive benefits on behalf of their U.S.-born children who are awarded U.S. citizenship at birth, and thus have welfare eligibility like anyone else. It’s very common for a household getting food stamps or TANF to be what’s referred to as a child-only household, and this is actually true not just of immigrants. And if the parents don’t meet the requirements for TANF or food stamps, then basically the benefit comes in the name of the children. And this seems to be very common among immigrants. In fact, otherwise-ineligible immigrants – illegal immigrants or legal immigrants – are actually allowed to live in public housing if they have just one U.S.-born child. So I think that is – that is very difficult to think of a way in which it would be somehow barring immigrants from using those programs through their U.S.-born children. The bottom line is, practically and politically, barring low-income immigrants and their children from welfare after they’ve been allowed into the country is probably not possible. Even among illegal immigrants it’s difficult. After all, are we really going to cut off low-income children, disabled legal immigrants and the working poor from welfare once they’re here? In a country that often makes public policy by heart-rendering anecdote, that seems very unlikely indeed. Let me conclude by arguing that it is a mistake to see the high welfare use rates of immigrants as a moral failing on their part. Most immigrants come to work, and most do work. It merely reflects, if you will, the intersection of three trends: a modern U.S. economy which offers low wages for the less-educated, an expansive welfare system, and an immigration system that admits large numbers of less-educated legal immigrants and tolerates illegal immigration. It’s also not particularly helpful to compare today’s immigrants with those who arrived a hundred years ago – you hear this all the time – because there was no welfare state a hundred years ago. So how is it really relevant? We don’t know what your ancestors might have done, if you’re native-born, because there was no welfare state. But I’m betting, if there was, they would have accessed it at very high rates, too. Now, the important thing is, under the current system, some 20 to 25 million new legal immigrants will settle in the country in the next two decades – under the current system. That’s a lot of folks. The overwhelming majority will be allowed into the country regardless of their skills, mainly because they have a relative here. If we want to avoid high immigrant welfare use in the future, we will have to move to an immigration system that’s more selective – selecting highly-educated immigrants who are unlikely to use these programs. If we choose not to make those changes, we must accept without complaint the welfare costs created by the current system. ROBERT RECTOR: Well, I just wanted to say this is a really excellent report that contributes a lot to this overall issue. I’m going to piggyback with my research. My research in the past is based on the Current Population Survey, and this report is more accurate and more thorough because it uses the – (chuckles) – the impossible-to-use SIPP survey. And in – the way I’ve characterized this in the past is that a high-school dropout is a high-school dropout is a high-school dropout. I love Gertrude Stein. But it doesn’t really matter whether or not a person with a 10th-grade education is born in Kentucky or Guatemala, and they basically will access the U.S. welfare system in a very similar way. And this is pertinent because roughly half of the illegal immigrants that would get amnesty do not have a high-school degree. They have less than a high-school degree in – you know, in a foreign education system that was probably itself not particularly good. And so typically, in the U.S., let’s – overall, the means-tested welfare system, that is a system of over 80 different federal programs that provide cash, food, housing and medical care for lower-income people. The total spending on those programs last year was over $1 trillion, and roughly one out of three Americans received benefits from at least one of those programs. This does not include Social Security and Medicare. Everybody knows those are big programs. Most people have no idea how large this anti-poverty welfare system is. And what the system does is it subsidizes less-capable, disadvantaged Americans. It subsidizes workers and non-workers. There’s sort of a conservative myth that people that get welfare somehow sit off in some bizarre place – I don’t know where it is – (laughter) – and they sit there for a lifetime and collect welfare, and, like, oh, I have to go get them, you know? Is it – you know, it just – that’s preposterous, OK? In fact, the largest cash welfare program is the Earned Income Tax Credit. You might notice the word “earned” in there. You don’t get this thing unless you at least claim that you’re working. MR. RECTOR: It is a huge welfare program. And just to give this as an example, if you’re a single mom with two kids and you’re not working, in general, in the average state you would get around $24,000 in cash, food and housing from the government. If you work at minimum wage and earn, say, $15,000 a year, you get about $24,000 out of the government. It’s exactly the same thing. No Republicans understand this. They are absolutely ignorant of the welfare system, and they just say, well, I’d like it to go away. The reason for that is that, as you start to work, indeed, food stamps go down. If you’re getting Temporary Assistance for Needy Families, that will go down. But as those benefits are going down, the Earned Income Tax Credit and the Additional Child Tax Credit, which – they are cash handouts to the poor, go right up in proportion, which means that the average person can have a combined – a single mom can have a combined earnings plus welfare of ($)35(,000) to $40,000 a year, and they’re working, OK? People don’t understand this. This is how you spend a trillion dollars a year, OK? And it doesn’t matter whether you – what matters for the most part in where all this trillion dollars a year goes is the education level, and therefore the wage level of the worker. It doesn’t matter whether – you don’t need to not work. The people who work and have low wages we very much have, in the last 20 years after welfare reform, have refocused the welfare system on subsidizing those families specifically, OK? And if you grant illegal immigrants legal status, in every single bill that does that, they – within a few years they grant every single one of them access to all 80 of these different programs, including Obamacare and so forth. It’s extremely expensive. The typical family, from – a U.S.-born family where the head of the household does not have a high-school degree, receives $19,000 a year in means-tested welfare, OK? Altogether, if you take their – all their government benefits and the education for their kids and the cost of highways and police and things that they use, that type of family receives over $50,000 a year in government benefits and services. They pay around $10,000 a year in taxes, OK? And if you look at legal immigrants, it’s exactly the same – or with Steve’s research now it’s somewhat worse for these low-skill legal immigrants that don’t have a high-school degree – four or five to one in benefits relative to taxes. What you’re doing when you talk about amnesty is taking a population that’s predominantly high-school dropouts and effectively giving them access to the most expensive welfare system in the world, OK? People say, you know, we don’t want to have a cradle-to-grave welfare state. We have a cradle-to-grave welfare state. Per capita, social welfare spending in the U.S. is higher than in any other European country. It’s an extraordinarily – or as high as those countries on average. We have a very large, expensive welfare state. If you bring in less-skilled people, they cost money under that system. But that’s all the good news, OK? (Laughter.) That’s the good news. The reality is that when you look at this sort of individual – and these are – again, this is – there’s no moral defect here. We have a system that’s designed to support disadvantaged people. We give them a lot of things and we don’t tax them very much. And the fact of the matter is that we can barely afford to do that for people that are born in the United States. If you bring in large numbers of people legally or illegally of that sort, then that imposes enormous fiscal costs on the U.S. taxpayer that won’t go away. But the bottom line is, you could take and abolish all 80 means-tested welfare programs – Medicaid’s gone, Obamacare is gone, food stamps is gone – you know, it’s a libertarian dream world, OK? At last, we’re free. And all of that, it makes no difference whatsoever. You could, in fact, eliminate all means-tested welfare and all public education, too – that would be a good one – and this – the high-school dropout, the person who does not have a high-school degree, is still in fiscal deficit. They still do not pay enough in taxes to cover their normal, routine services – police, fire, so forth – plus the costs of Social Security and Medicare, OK? So great, you know, let’s – the libertarians like to say, as you know, the problem here isn’t open borders, it’s that we have this welfare state. I always say, OK, please abolish the welfare state. Give us a call when it’s done and then we’ll talk, you know? But it doesn’t even matter, OK, because the welfare that Steve has outlined here, which is extraordinarily costly, even if you could completely restrict it or you could get rid of it entirely, these households at this level, once you grant them legal status, still are profoundly in fiscal deficit. They will receive much more in government benefits than they pay in taxes. The bottom line is that we live in a massive redistributive state. We take roughly a trillion-and-a-half dollars a year out of the top quarter of the population and transfer it to the bottom through a wide variety of programs, of which these means-tested welfare programs are just the most obvious. But there are other transfers as well. And we don’t tax the bottom very much; they don’t pay for themselves. I have no particular problem with that. The problem is, if you bring in more and more people that are effectively net taxpayers (sic), somebody has to pay for that. And that’s what – the big, dead elephant in the room that no one in the amnesty debate wants to talk about. The bottom line is that a high-school – this sort of low-skill immigrant, whether the – person, whether he’s born in the U.S. or born elsewhere, really does receive about four or five dollars of government benefits for every dollar of taxes paid. Now, the libertarian right has these complicated arguments vis-à-vis illegal immigration – that somehow, even though they acknowledge that if you legalize them they would get all these welfare benefits and so forth, it’s very, very costly, they produce these obscure positive externalities that boost other people’s wages and all these really complicated things, and therefore they essentially pay for themselves. And the question is, OK, if someone who has a 10th-grade education, that’s coming from a foreign country, and basically their work and wage rate is very similar to someone that has a 10th-grade education that’s born in the United States – they’re essentially virtually identical – if that person produces all these obscure externalities that more than compensate for any fiscal costs they impose, why isn’t that true for the person born in the United States? What’s the difference between the two? Particularly, what’s the difference between the two if you grant the illegal access to all these programs, which is what amnesty does? And in effect, what that type of argument is saying is that the welfare state in general is self-funding, that all of these low-skill workers somehow produce these magical externalities that more than pay for themselves. That is not exactly a conservative economic argument, and in any other context it would be dismissed as completely preposterous. This is, again, an excellent study. It contributes to the debate. It adds to the debate. The problem is that this is just something that, if you’re in the amnesty camp, you just don’t want to hear about this, right? You just don’t want to hear the obvious fact that even without granting amnesty illegals receive considerably more in government benefits than they pay in taxes. I said they cost a lot. If I were to put these alterations that Steve has, they cost even more than I’ve said in the past. It’s something that you have to confront at the forefront of any debate about future either illegal immigration or legal immigration, based on the expected receipt of these benefits. MR. KRIKORIAN: Thank you, Robert. Although, you know, if you’re losing money on each unit, you can always just make it up in volume, right? So – (laughter). MR. RECTOR: That’ll do it. MR. KRIKORIAN: And Reihan, go ahead. REIHAN SALAM: Thanks very much for inviting me. I’m very grateful to the Center and to Steve for producing this report, partly because, you know, I came to this issue initial as an opinion journalist, someone who’s trying to seek out information about very basic questions. For example, when we talk about the incidence of hunger in the United States, to what extent does this relate to the foreign-born population? Seems like a very simple, very basic question. It’s, in fact, extraordinarily difficult to get a straight answer on that question. Recently, Kathryn Edin, a celebrated sociologist, just co-authored a new book with collaborator Luke Shaefer on “$2 a Day” poverty in the United States – basically, the number of Americans who are living below a global poverty standard. Now, there are a number of issues with this book. You know, for example, she’s relying on self-reported surveys. She’s relying on income reporting, which is different from consumption reporting. Lots of issues. But it’s an extraordinary look at, you know, millions of American families living on very, very low incomes. Now, what’s striking about the book is that there is no treatment of immigration in the book at all. In fact, the word “immigration” or “immigrant” comes up, I believe, on two or three occasions, talking purely about the 1996 immigration – excuse me, welfare reform legislation. But, you know, really she is talking about people in the Mississippi River Delta. She’s offering an ethnographic account of populations that are part of the entrenched multigenerational core in this country. But of course, those are not the only people who are extraordinarily poor in this country. It’s this incredible mystery. And this is the kind of basic data that you’d think that we would be getting from public agencies, but it has to be independent researchers who are producing this report. And you know, we can all speculate as to exactly why that is, but I think that it’s very telling that, you know, you haven’t seen people question the basics of the data that Steven has presented. I think there’s a reason for that. And I also think that the federal government should have an obligation to report this kind of data in a more reliable and systematic way. So, again, on one level I just come at this purely as a journalist, someone – you know, most of the people that I know are either first- or second-generation Americans. I grew up in New York City. That’s where I live right now. It’s a heavily immigrant community. And there are a lot of extraordinary basic questions about living in a place like New York. For example, the availability of market-rate private housing for someone who is a, you know, middle-income professional, it’s challenging. It’s a very expensive place to live. How, exactly, are immigrants managing to make it? Well, part of it is large-scale violation of housing and zoning laws. Now, this is not because, again, these immigrants are bad people; it’s because their market incomes are extraordinarily low. Over the last year, year and a half, we’ve had a spate of stories about the so-called contingent workforce. Many of these stories have been around the idea of Uber drivers who are working in a very contingent way. Why would anyone want to do this kind of contingent work? The simple answer, if you talk to anyone – and this is particularly true in New York – is that your other labor market opportunities are, in fact, far worse than working in this contingent fashion. And actually, people are extraordinarily grateful for these job opportunities. So, to the kind of middle- and upper-middle-income journalists who are kind of shocked and horrified by what’s happening – by the fact that people are engaging – you know, entering this kind of contingent work voluntarily – I think that’s something that they really need to think about. How much do you actually know about the labor market opportunities offered to people not only with limited skills, but also with limited social networks? Similarly, The New York Times published a harrowing, fascinating story this year about nail salons by a reporter, Sarah Maslin Nir. And basically, what she found in this story is that there is a large number of less-skilled immigrants, many of whom are from East Asia, who are working for sub-minimum wages in nail salons, where they’re oftentimes subject to, you know, dangerous and illegal labor practices. Now, the trouble with this article – this article was extremely illuminating, extremely helpful, but the trouble with this article is that, again, this is the best labor market opportunity these women have identified. Were there another, more attractive labor market opportunity, they would presumably be working that job rather than this job. It’s a very, very basic point that people refuse to reckon with, and I frankly find it baffling. So, then, the solution is that Governor Cuomo will appoint a taskforce. He will, you know, shut down a few nail salons or whatever else, or, you know, launch a new series of investigations. But again, does that mean that if I’m an employer I’m necessarily going to start paying these women, let’s say, the equivalent of $15 an hour? And again, keep in mind that for a very wide swath of Americans we have decided that it is unethical for employers to pay workers less than a living wage defined at somewhere between ($)12 and $15 an hour. Now, I don’t know how many of you guys had summer jobs at a certain point earlier in life or whatever else, but – or how many of you have run small businesses of your own, but a $15 wage is oftentimes a wage that someone works up to as they acquire experience, as they acquire various non-cognitive skills that allow them to become productive contributors in a workplace. And you know, to some extent you have people who are earning, let’s say, a training wage, you know, where there is kind of less risk and whatever else, you know, you’re taking on, these employers. But, you know, again, we are collectively deciding as a society that this is unacceptable. And I think that, you know, the National Employment Law Project had a fascinating study where they were accusing low-wage employers of basically making use of subsidies like the EITC to kind of subsidize their low-wage workforce. Now, the conceptual problem with this is that you could say that poverty is a broader American problem and that taxpayers have to mitigate the poverty problem; it’s not solely the responsibility of employers to go about doing that. When we’re talking about immigration, however – and particularly when we’re talking about employers who are agitating for immigration laws that allow them a larger low-wage workforce – we’re dealing with a very different situation. When you’re talking about, for example, employers in agribusiness who are saying that, you know, the only way they can make their agricultural operations work is with a very low-wage workforce, there are a couple of things we forget – one of which is that, actually, this kind of agricultural work, like working in a nail salon, is actually extremely physically strenuous work. When people say that we cannot lower the Social Security – we cannot increase the Social Security retirement age because some people do backbreaking work, some of the people they have in mind are people doing this intricate work with their hands. Now, if an agribusiness can’t afford to pay someone a reasonable wage right now, surely they cannot also afford to deal with a lifetime of pain that is caused by doing this kind of work. Surely it is reasonable to suggest to agricultural employers that we might want to invest in more capital-intensive solutions, given that actually all of society is bearing the costs of this physical pain endured by these women and men – some of whom are very young, some of whom are incapable of working by the time they enter their late 40s and 50s. And again, this is not because they are bad people. This is not because they are not willing to work. This is simply because certain kinds of backbreaking work are simply incompatible with a society like our own and the kind of social expectations that we’ve developed. Now, there are many fascinating aspects of this report, but I would argue that in some respects it actually – and I think Robert alluded to this – in some respects it actually underestimates the scale of the problem. And why is that? So when we’re looking at the welfare state at the federal level or when we’re looking at a problem like – when we’re looking at a program, I should say – excuse me – like Medicaid, you’re looking at essentially cutting checks. You are cutting checks to medical providers, let’s say, for offering a given medical service. You are cutting checks directly to individuals to kind of help them, you know, have a higher income, despite having a very low market wage. But actually, many of the services required by people who are part of the entrenched multigenerational core, and particularly many of the services required by their children, are labor-intensive services. That is to say, you know, it could be that if my parents are illiterate or they do not speak fluent English, I might need more personal attention when I’m attending a public school than someone else. I might need a lower teacher-student ratio in my class. I might need social workers. I might need a whole suite of services to have any hope of actually closing some of those deficits I am experiencing in my household. The trouble is that labor-intensive services in a high-productivity, high-wage society are more expensive than they are in a low-productivity, low-wage society. This is a phenomenon known as Baumol's cost disease. It is very close to an iron law of economic life and economic development. Now, if you look at Norway, this is a country where, you know, the Norwegians had a very open debate about immigration, particularly vis-à-vis refugees and asylees. And one thing that they have determined is that – you know, again, Norway is a very high-cost, very affluent society, but they’ve determined that to provide for one single Syrian refugee in their country it would cost almost $100,000 in services. Now, let’s stipulate that that’s going to be higher than it would be in the United States because there’s a far more generous suite of services. They also determined that to provide for the basic needs of that same refugee in Jordan, they could provide for not only that refugee but for 25 of them. One of the extraordinary things we’re looking at is this kind of cosmopolitan argument for immigration – that we have an obligation through the lens of global redistribution to kind of meet the basic needs of very poor people around the world. And I’m willing to concede that there may well be some truth to that. But given that meeting the needs of these people and giving them a fighting chance to become part of the middle class is so extraordinarily expensive there, and given that the cost of living is also meaningfully less expensive in let’s say a middle-income country like Mexico, you’re dealing with a situation where there’s this deep illogic. You know, Sweden is going through a period right now where they’re actually cutting their overseas development assistance budget to increase the spending on refugees and asylees in their native country. Now, keep in mind that the aid budget is helping a much larger number of people in gross terms than the refugee budget. So I think that thinking about that even from that perspective of global redistribution, there is a certain confusion underlying this logic. So there’s another dimension I’d like to talk about. And I don’t mean to drone on for very long, but there are two other things that I’d like to mention, one of which is the political economy of welfare use. Now, one of the points that Robert’s been making is that it’s simply silly to say, OK, we can simply cut off these people and that will solve the problem. Well, one of the reasons that’s true – and again, this research is contested, but you have a number of researchers, people like Hilary Hoynes, who claim that access to SNAP is extraordinarily beneficial for children growing up in very poor households. These children might experience cognitive deficits later in life if they do not have access to SNAP. Now, again, you know, we could debate that. You know, perhaps that’s not true. But if it is true, the idea of cutting off very poor individuals – who are, by the way, Americans. They’re native-born citizens. They are not people that one can deport. That is something that’s very costly indeed that goes to the broader point that Steven is making in his report. So I think that, you know, there is a certain naiveté around that. And there’s also – look at the debate around Obamacare’s Medicaid expansion. What you see in state after state, including in Republican states, is that you have hospitals, you have medical providers, you have other political interests that are saying that we want Medicaid expansion. Why? Because Medicaid expansion means revenue for hospitals and medical providers. To say that you’re going to have a large universe of people who are going to be excluded from access to basic health benefits – which, by the way, is a huge part of the suite of anti-poverty benefits – just represents a simple confusion. And let’s bracket the question of whether or not it’s simply indecent. The Oregon Medicaid Experiment recently found that, for many of the low-income people who gained access to Medicaid, it was worth about 20 cents on the dollar to them. That is, they would have much rather had 25 cents in cash benefits than a dollar worth of Medicaid benefits. That tells you that there’s a political economy issue here. It’s not just immigrants, let’s say, who are demanding these programs; it is actually medical providers who are demanding the expansion of Medicaid. And if you want to disempower doctors and nurses and hospitals, you’re very welcome to try, but that’s profoundly naïve. So again, you have to keep in mind that it’s actually – or also think about in any inner-city community the number of businesses that depend on SNAP revenue. Do you expect them to just welcome the prospect of the SNAP rules being slashed in half or of people going hungry who are already part of our society – again, including American-born children? That seems profoundly foolish to me. But the other thing I’ll mention – and this is a much more contentious subject, but I do think it needs to be raised – we now live in a society in which we have a belief in racial inclusion. We believe that the elite of our society should be broadly representative of the society of the whole. That’s one reason why we are profoundly concerned about the fact that, for example, African-Americans remain underrepresented in the upper echelons of American life in many different domains. Now, part of the immigration issue is that you have a huge number of people who, again, have very limited skills, and their children are likely to struggle. What this means is that 20, 30 years hence you’re going to have a large number of native-born Americans who are going to observe that people of their origin are sorely underrepresented in the upper echelons of our society. Now, it could be that, you know, they will be entirely delighted with that outcome because, of course, they were given access to Medicaid, SNAP and various other programs as children, and so they’re going to feel a deep sense of gratitude and they will recognize that, you know, of course it is inevitable that people with, you know, limited levels of literacy and numeracy are – you know, the children of such people are going to have a much harder time. I would argue that, for good reason, it might lead them to start questioning the legitimacy of American society, its basic fairness. And I think that you already see this. The Public Religion Research Institute releases a survey of Hispanic values. The last one was released in 2013. And what they found is that first-generation Hispanic immigrants are actually far more confident of the fairness of American society. They are far more likely to believe that America is a society in which people of any background can flourish and achieve upward economic mobility than native-born Hispanics. Now, it could be that immigrants, including recent immigrants, know much more about American society than someone like me, who was born in the United States. You know, I’m 35 years old, lived here my whole life, and I’m very keenly – well, I think that I’m keenly aware of the various ways that society can be really rough for people whose parents don’t have a ton of skills, don’t have a ton of education. I’m someone who has a deep – or I think – again, I think that I have a deep understanding of the role that social networks play in achieving upward mobility. You know, there’s been a great deal of work by sociologists recently about this idea of racism without racists. And the basic idea is that, look, opportunities are spread through your social networks, and when you’re dealing with a society – a U.S. society in which the level of educational attainment is much, much higher than it had been a hundred years ago, yet the educational attainment of immigrants is much, much lower, the level of social intermingling between these groups is low – again, not because of racism, but simply because we have a society in which we have a higher level of assortative mating. People marry people with similar education levels. They become friends with people with similar education levels. We are creating, I fear, a ghettoized minority. And for however much you do to actually make this constituency – to give them the resources they need to lead a decent and dignified life, it is not going to facilitate the kind of upward mobility that we care about. You know, there are things we might do, but again, those things are labor-intensive and far more expensive than anything that we’re contemplating right now. So I would ask people on the political left – who, again, might be disinclined to trust me because, of course, I am a conservative, but I think that we share a lot of the same concerns – to think hard about this. If you believe that it is indecent to pay someone less than $12 an hour, let alone $15 an hour; if you think that it’s positively indecent to not give poor children, regardless of whether their parents are less-skilled immigrants or natives, access to SNAP, to Medicaid, to a suite of other benefits; you need to think very hard about our prospective immigration policies. And finally, if you’re someone who cares about the idea of ethnic and racial justice, and who cares about the idea that people who are any different background feel as though they have a fighting chance to make it not only to the middle class, but perhaps even to the upper echelons of society, you need to really think hard about the ways that we’re sowing distrust by not confronting the difficulties that less-skilled, low-wage workers in this country face. Steve, did you have any quick responses before I ask for questions? You don’t have to. MR. CAMAROTA: No, hey, by the way, Reihan, have you ever seen the work by Borjas where he looks at the last great wave of immigrants? He looks at the groups that are least educated in 1910 and then he looks at their descendants or grandkids in 1970, and he finds a pretty strong correlation that the groups that were least educated in 1910 did the worst and the groups that were most educated by 1970 did the best. And it’s very complicated to do that kind of thing and the data’s limited, but it certainly supports a lot of what, you know, you were pointing out. MR. SALAM: I have seen it, and I think that it’s certainly contested and people debate about this. But what I will say is that when you look at lots of pro-immigration scholars and advocates, what they will often say is that less-skilled immigration has no impact on natives. In fact, they will claim that it has a positive benefit on the wages of natives. Now, again, when you’re looking at this positive impact, it’s actually quite trivial in most cases. But what they tend to neglect is that there is pretty much no dispute that new less-skilled immigrants put intense pressure on the wages of older less-skilled immigrants. And I think that, you know, the idea that we can just put that to the side is very strange when 15 percent –1-5 percent – of the U.S. workforce is foreign-born, it’s very disproportionately less-skilled, and this is literally the biggest integration challenge that we face in this society. So I think that even if you bracket that kind of finding – which I happen to find very interesting and useful and worthwhile – but even if you bracket that, the people who are the advocates are relying on scholarly work that makes it unambiguously clear that it’s actually previous less-skilled immigrants who are challenged. So I think that that’s something that – you know, again, something that no one disputes. MR. CAMAROTA: Yeah. In fact, I was once on a radio show with Giovanni Peri, who makes that argument. Essentially, he put out a study saying, look, immigration doesn’t have that much impact on less-educated natives in California. But to get to that result, it had to reduce the natives of like high-school dropouts who are foreign-born – who make up most of the high-school dropouts in the state and a very – a lot of them are illegal – it had to reduce their wages by 17 percent. But he said, but it made everyone else a little bit richer, so that was OK. It was amazing that he would just defend that position. It seemed very odd. MR. SALAM: And by little bit, I mean, again, we need to keep in mind how small these numbers are and how, you know, frankly, their numbers – well, yeah. MR. KRIKORIAN: Any questions? We have a microphone. I have a question while you guys are thinking of questions. This is maybe more for Robert because Reihan may just dismiss the people who make this argument as kooks, which they kind of are. But there is this libertarian argument – Tom Bethell made it years ago, Alex Nowrasteh at Cato makes it now – that it’s actually good to have very high rates of immigrant welfare use because it will destroy the welfare system. In other words, it’s sort of a Leninist worse-is-better kind of – and I mean, it’s not a joke. They actually sort of are – seem to be seriously making this argument. I just wondered if Robert or anybody – Reihan – had any thoughts on that. MR. RECTOR: It reminds me of a couple of old leftists, Fox and Piven, who basically tried to bring down New York City by swamping the welfare system way back in the early 1970s. Didn’t work, just made New York City a lot less livable. You know, it’s just goofy. The point more is that they like to play these games to try to pretend that reality doesn’t exist. If you – for example, they will say, oh, well, you have all these surveys that show that – what immigrants get in welfare, but immigrants don’t get welfare because we barred that in 1996, you know. And I was involved in writing that law, you know, and I – you could say I – back at the – I testified at the time. I said, look, it’s OK to put this five-year time limit – you can’t get food stamps for the first five years you’re here, you can’t get TANF and so forth – but essentially this is de minimis. (Laughs.) It’s essentially a joke, guys. I know you like to joke with the taxpayer, but this is a joke, OK? (Laughter.) Because in fact means-tested welfare is, in fact, a lifetime stream of benefits, that if you’re young and you have children you get – you get TANF maybe, but you get slightly older you’re still getting food stamps, you still may be getting Medicaid. You get slightly older than that, you’re likely to become disabled, get SSI. And so that benefit stream goes on, it doesn’t stop. And putting a five-year time limit has, as you can see, absolutely de minimis, no really measurable effect at all, OK? And then I love your – the deeming thing. I mean, conservatives find this remarkable provision – well, if you’re a public ward you can be deported. I’ve been in the welfare field for close to 40 years, you know. I have yet to see anyone deported on that provision in the entire welfare state. But it doesn’t matter because, you know, we can raise that thing. The reality is that – it’s bizarre what the libertarians do because the type of analysis that I do and that Steve is doing, when libertarians look at it, when they look at my analysis – and I actually have a paper coming out next week where I use this same sort of analysis, the total benefits received by a population, total taxes paid – it’s called fiscal incidence, is the technical term – and I don’t look at it in terms of immigration; I look at it just in terms of rich people versus poor people. And I show what – you know, the bottom 20 percent take this much and pay that much. This is how much the – and that shows that there’s a trillion to a trillion-and-a-half transfer from the top to the bottom. I presented that in front of libertarians from Cato and elsewhere. As long as it’s just in that bland sense, they say, oh, yeah, this is great analysis, look at how big the welfare state, you know. But immediately you put the word “immigration” in it and, oh, you know, it’s the – it’s the least competent research ever performed by a conservative. (Laughter.) The guy is a scandalous liar. (Laughter.) You know, it’s exactly the same thing. You know, it’s exactly the same thing. And the bottom line is, as I said earlier, it’s very simple. If, in fact, a person who is at the bottom, that doesn’t have a high-school degree, as Cato would contend produces all these externalities that compensate for that trillion-and-a-half dollars in transfers, why isn’t the same thing true for a person that’s born in Kentucky or Illinois or something? They’re the same low-skilled workers. They’re very, very similar. In effect, what they want to do is – I mean, they’d love to get rid of the welfare state, but they at least want to pretend that it doesn’t exist in order to facilitate the ideology of open borders. MR. SALAM: I would like to weigh in on this. I believe that, if anything, the opposite is likely to be the case. Now, one of the findings that is oftentimes touted by immigration advocates is that if we look at Denmark, this is a society where we’ve seen the upgrading of skills – of less-skilled natives – in response to less-skilled immigration. Now, what people fail to understand about the Danish example is that Denmark went through a period of absorbing a large number of refugees, many of them from the former Yugoslavia and from the Horn of Africa. What then happened, incidentally, is that, having absorbed this population, then the Danes embraced very restrictive immigration policies – and by the way, they’re embraced on the political right, but also on the political left in Denmark. But this upgrading of the less-skilled natives did not, in fact, happen automatically. Now, this is a kind of difficult thing for many of our friends on the libertarian right to appreciate, but what in fact happened is that, going back to Baumol's disease, there were extremely labor-intensive interventions by social workers and various other professionals in Denmark who worked with less-skilled natives to actively upgrade their skills. It’s also worth noting that, while it is indeed true that less-skilled immigrants can be complements for less-skilled natives in some cases – which is the usual argument deployed by economists who are doing this work, by immigration advocates, et cetera – that is not, in fact, true for everyone. In a society like ours, there are indeed some less-skilled natives who are going to be able to capitalize on the opportunities presented to them by a large number of less-skilled immigrants. But there are also others who suffer from social, cognitive and a variety of other deficits, you know, where they are not able to respond quite so easily. And if they are going to respond, again, you’re dealing with very expensive interventions. So, if anything, when you have the kind of displacement of part of the less-skilled native population, you are likely to need more welfare spending rather than less. It is welfare spending of a different kind – indeed, welfare spending of a kind that you could describe as more intrusive, more involved. There is a woman – Toby Herr of Project Match – and one – she’s done this fascinating work for years and years on trying to facilitate the transition from welfare to work. And one thing that she’s found is that even with the best-financed programs, with the most-involved interventions, what she finds, that a year after the intervention only about half of the people who took part in this extremely expensive, involved program are actually still attached full-time to the labor force. Upgrading the skills of people who are part of the marginalized poor is extremely difficult. And I think that as you increase the numbers of people who fall into this category, again, you’re not just talking about immigrants, but you’re also talking about displaced natives. This might not be a majority of natives. It’s not going to be all natives. But it is a nontrivial number of people to whom we have, in my view, a profound social obligation. So I think that this view is simply naïve. The point at which you’re going to break the system is the point which we’re going to have a series of political clashes and tensions that are going to be about a lot more than the welfare state, and I’m not if we want to actually make that gamble. MR. KRIKORIAN: Yes? If you could identify yourself, too, please. Q: I’m Ali Meyer. I’m a reporter with the Washington Free Beacon. My question is regarding – I think you kind of touched on it a little bit, but last week the jobs numbers came out, the BLS, and they have the number of employed foreign-born workers, which includes – they don’t distinguish between illegal immigrants and legal – and then the native-born. And they found that the number of foreign-born employed people has gone up, while the native-born has gone down. Now the unemployment rate for foreign-born workers is less – is lower than the unemployment rate for native-born. So I was just wondering if you can talk about that a little bit. MR. CAMAROTA: Yeah. I mean, in my other life as someone who looks at the labor market a lot, there are very troubling trends in the U.S. labor market. If you looked at the period 2000 to 2014, although the native-born accounted for two-thirds of the growth in the working age – 16 to 65, say; you could do it 18 to 65, wouldn’t make much difference – they didn’t get any of the net gain in employment between those two years. Now, obviously it goes up and down. It vacillates with the economy. Things have got a little better since the middle of 2014. But what we can say is that a disproportionate share of jobs relative to their fraction of the population, relative to their share of the growth in the working age, has been going to the foreign-born. What’s been happening is that the native-born, particularly the less educated, just work less and less. The other thing about the native-born, the less educated – say only a high-school education or less than a high-school education – they earn less when they do work. Now, if immigration was a really good deal for the less educated in the United States, you would have expected the last 10, 20, 30 years to be really a boom time for the less educated because the immigrant share of the U.S. population almost tripled from 1980 to now. But it’s been one of the worst periods ever for the less educated. So if the – if immigrants who are less educated really do help less-educated natives, we don’t see that when you look at the big picture, anyway. It’s been a disaster, right? I mean, you know, their wages are down 10, 20 percent. The fraction holding a job has declined 5, 10, 15 percentage points. The majority of high-school dropouts in the United States who are of working age don’t work anymore. Those with only a high-school education work a whole lot less. So we have an explosion of non-work. Q: They say it would be worse. MR. CAMAROTA: Yeah, maybe that’s right, immigration made it better so that although there was this massive downturn for these folks – so that’s the argument you’d have to make. But on its face that’s not what you see in the data, and you have to make some pretty big assumptions to argue that a less-educated native and a less-educated immigrant don’t compete. And the fact is that it’s really hard to make that argument for, say, the 1 million native-born people who work as maids and housekeepers in the United States who compete with roughly 900,000 immigrants. In other words, that occupation is almost half. It’s kind of hard to make that argument for the 1 million or roughly, something like that, 800,000 Americans who work in meat and poultry processing who compete with a similar number of immigrants. They seem to be doing exactly the same job. They seem to have similar skills. So, as Reihan said, you can have a mixed situation, right? You can have a situation where some Americans clearly benefit from immigration and some are made worse off. And the problem with our immigration system seems to be the ones who are being made worse off seem to be the least educated and poorest to begin with. MR. RECTOR: I think it’s good to emphasize that in almost every field, every occupation where illegal immigrants are prevalent, there are large number or a majority of the workers in that field are native-born, and they’re competing with that. It’s just ridiculous. So how – where is this labor market segmentation that occurs? And moreover, even if it does occur – let’s say that somehow, you know, in period X large numbers of drywall hangers and construction were native and now they’re not. Well, the drywall hangers that were native had to go someplace. And let me tell you, they didn’t go and, you know, get a degree in dentistry or something like that, which is what a lot of these studies would imply. They went over and now they’re competing in – you know, in low-skilled carpentry or something like that. And because of that, you basically see a pretty bleak picture for the lower-skilled, particularly lower-skilled male workers. Looking over the last 20 years, you see a lot of people dropping out of the labor force. You don’t see, in my mind, any of this indication of this – you know, this boon that’s come to them through immigration. In fact, the effects seem to be the opposite, and they’re what you would expect. MR. KRIKORIAN: Well, it’s kind of like communism: it works, it just hasn’t really been tried yet. (Laughter.) Anyway. Any other questions? OK, well – oh, yeah, Don. Wait for the – wait for the mic. Q: I think this is a very enlightening panel for me, and I have learned a lot. I’m a writer and I have been writing a lot about another aspect which was not brought up this morning. And I just finished reading a fascinating book by a well-researched author named John Grisham, who wrote a book called “Gray Mountain,” which talks about the really poor, poor, poor people in the – in the country. And I think, as you go along, when you add the issue of automation to this whole mix, you’re going to find that there’s a confluence here of really dangerous proportion. And when you talk about a trillion dollars a year in excess costs, I think it’s going to be very fascinating to see where this goes. There’s a – there’s a cross-section here, and I think the majority of American people understand where we are in a very loose sense. They don’t come – they don’t come nearly to the level of sophistication that’s been expressed by this outstanding panel this morning, but they’re getting it in various ways. And I applaud you for that. Thank you. MR. RECTOR: If I could just jump in on that, 10 years ago the phrase that was used is that illegal immigrants are doing the jobs that Americans won’t do. Now, that was insulting and false 10 years ago, all right? It’s insulting to millions of American workers, right? Just amazing. But nobody says that anymore – (laughs) – because you have this massive underemployment rate among low- and moderate-skill workers, you know, and it’s preposterous to say, oh, these people won’t, you know, work in hotels, they won’t – they won’t be waitresses, they won’t work in construction. It was ridiculous, you know, in the early – around 2005; it’s really, really ridiculous today. But my other field is welfare, you know. And if – and so I have this schizophrenia that I’ve experienced in the left really for about 15 years because when you are talking immigration, the mantra is, oh, these are jobs that Americans won’t do, it doesn’t displace any – you know, everything is fine, we need these workers because we have all these empty jobs that have to be filled by this flow of legal or illegal low-skill immigration. And then I’ll go to the next room, where I’ll be talking about, say, the inner city, you know, or black families, OK? Now, for the left, the black family is in terrible trouble. Seventy percent of black children are born outside of wedlock. Most good researchers would indicate that’s a really bad problem. And the reason – the iconic reason is that there are not enough jobs – (chuckles) – for low-skilled black males, you know? And because they don’t have jobs and they have low wages, that means – that’s why there is such a low – and it’s also happening to Hispanics and it’s happening to whites – and the real problem is not enough jobs. So at the same time that we say, look, we have all these low-skilled jobs that are open, we have to bring in all this labor from abroad, you just change the format a little bit and the main problem for low-skilled families in the United States is there are not enough jobs for the – for the fathers, you know? You got to have one or the other, OK? And the data is pretty clear that there are jobs there, but that the wages aren’t going up. And the last thing you would want to do if you’re trying to help low-skilled families, if you’re trying to help families in the inner city, is push down the wages of low-skill male workers. I mean, it’s like the worst idea you could possibly have – but that, in effect, what I think we’re doing. Q: Do you see the level of inner-city violence as related to that? MR. CAMAROTA: Well, I mean, there is research – I could show it to you – where people have tried to look at the question or whether the presence of immigrants increases labor market stress in a city, and that increases crime. There are two studies that say yes. I mean, that’s a – it’s a – it’s a very complicated question, I could tell you. But can I just say this? I don’t think it’s – it’s important to state that the – that immigration is by no means, in my view, the only problem that the less educated face in the United States. They are facing – remember, 40 percent of all American workers don’t have – this is native-born – have no education beyond high school, right? I mean, there’s a lot of people who don’t have a lot of education. Probably everyone in this room, you know, most people you know are college educated. But that’s not true – that’s nowhere near the average in the United States. They face a lot of problems, right? International trade, you know, technology has worked against them. But if it’s correct, which I think the data – everyone agrees that they’ve not done well wage-wise, the rates of work, labor force participation, the benefits package they get. Everybody agrees the less educated, they’ve really taken it on the chin. So the question is, a lot of things we don’t have much control over: the pace of technology. Now, maybe trade – globalization is hard to do anything about. You can’t stop the Japanese from setting up factories in Malaysia. But immigration is something we can control, so it does seem exceedingly unwise to flood the unskilled labor market or the less-educated labor market. But again, it’s not the only problem that they face, but it just would seem to be a problem that we could avoid with a more sensible immigration system. MR. SALAM: Well, and Steve has also done very good and careful work on the crime question in particular. And I will just say that there are a lot of ambiguities, and there certainly some scholars who believe that it might have actually reduced crime levels, you know, so I think that, you know, there are – there are definitely varying opinions on this. What I’ll just say about the larger question you ask is that, you know, to answer this puzzle that Robert raised – how can it be that you have this paucity of jobs for less-skilled African-American men while you have, you know, other people who are entering the low end of the labor market, finding employment opportunities, et cetera – there’s a sociologist at UCLA, Roger Waldinger, who’s done a lot of fascinating work on this. And part of what he’s found is that people identify job opportunities – and by the way, this is not just for immigrants, but this is for everyone – through their social networks, and for immigrants often through their ethnic networks. Now, what often happens is that you will see the emergence of an ethnic niche in a particular industry. So there are coordination issues that arise in any workplace, and if I enter a workplace and if I, let’s say, speak Bengali, as my parents do and as I do, then, you know, it would make sense to have an entire workplace of other Bengali speakers. And of course, you’re going to have different ethnic niches, different, you could say, ethnic monopolies in different sectors and different regions. Now, that’s not going to be a very inviting environment if I am an African-American man, for example. You know, it might make the coordination somewhat more challenging. But that’s kind of one of these dimensions that actually contributes to this larger picture. And another thing that I want to focus on – and this isn’t so much about race, although it certainly is related to it – is the position of ex-offenders. There is a woman, Becky Pettit, who’s written a wonderful book called “Invisible Men” about the ways in which we arguably overstate the extent of black economic progress by discounting the disproportionate role played by people who are ex-offenders and the challenges they encounter in the labor market. There has been a recent effort to, for example, ban the box – that is, to prevent employers from asking their employees if they have ever been incarcerated – because there’s this perception that there’s large-scale discrimination against these individuals. Now, the thing is that, you know, this is an ethnographic question that I cannot answer definitively for you, but it is certainly a kind of widely held belief. If an employer has an option of hiring a less-skilled immigrant or a less-skilled native ex-offender, would they prefer to hire the immigrant or the ex-offender? Now, could it be that if you tighten the labor market and if I do not have the option of hiring a less-skilled immigrant, might I be somewhat more inclined to hire someone who’s an ex-offender – somewhat more inclined to give them an economic opportunity? Now, again, I cannot give you a definitive answer to that question. But I do think that, as a matter of logic, it makes sense that I might be more inclined to give such a person an opportunity, or also members of any stigmatized group. Stigmatized groups, you know, kind of suffer from discrimination, and there’s often a sense that I would prefer hiring anyone rather than a member of this stigmatized group. And lo and behold, when, you know, that’s your only option, you might start giving such people economic opportunities and the opportunity to climb the ladder. And I think that there is some value in that. I think there’s a lot of value in that.